Administration and Supervision, Instructional Leader, Ed.S., Administration and Supervision, K-12 Public School, M.Ed. 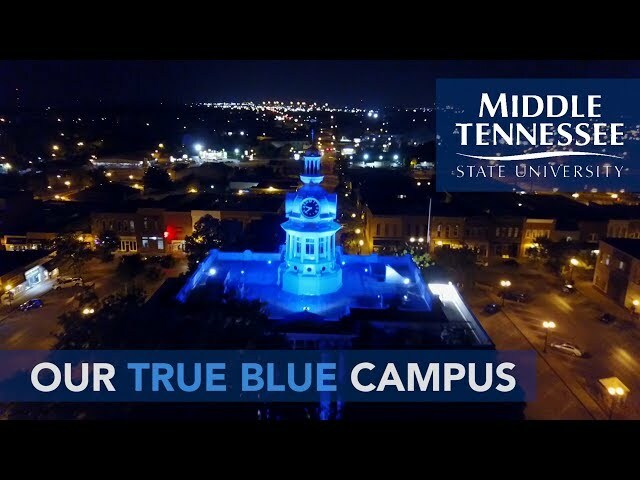 At MTSU, we take pride in bringing programs to you! If you are interested in pursuing a Specialist in Education (Ed.S.) degree with a major in Administration and Supervision and a specialization in instructional leader licensure or a Master of Education (M.Ed.) degree with a major in Administration and Supervision and a specialization in k-12 Public School, you may have the opportunity to study in your community. Fulltime tenured MTSU professors partner with practicing administrators within various mid-state school districts to teach courses. Through enrollment in our programs, students engage in a practical field experience (practicum) while completing a Specialist in Education degree or a Master’s degree in Administration and Supervision. The Womack Educational Leadership Department’s off-campus cohort programs meet students’ needs and help them accomplish their professional goals. A cohort can be formed through an interested student who contacts other individuals in his or her area. Click on the DEGREE tab for more details. Robert Vandiver’s success in MTSU’s off-campus cohort programs motivates him to recruit teachers in his area for these convenient learning opportunities. In 1999, he was working with the Wayne County School System at Collinwood Middle School in Collinwood but had not yet secured his teaching license. He joined an off-campus weekend cohort graduate program in Clifton, and with the help of Womack Educational Leadership faculty, he completed Tennessee teacher licensure requirements and in 2000 received a master’s degree. In August 2012, he joined an Education Specialist (Ed.S.) cohort held in Clifton and earned that degree in 2014. Also completing administrator license requirements, Vandiver has since held several principal positions and is currently principal at Collinwood Middle School. His enthusiasm for the cohort programs prompts him to make his schools available to host classes. In 2015, his wife, Jennifer, completed her Ed.S. through a cohort group in Waynesboro. “MTSU has played a vital role in my professional life, and I am very grateful to the Womack Educational Leadership Department and its faculty for contributing to my professional and personal growth as an educator,” Vandiver says. While working as a teacher in Spencer, Jared Copeland joined an MTSU off-campus cohort graduate master’s degree program in Livingston in fall 2013 and completed his degree in spring 2015. With that success under his belt, he decided to pursue an Ed.S. in administration. He was so pleased with his earlier cohort experience that in fall 2015, he recruited his own Ed.S. licensure cohort at Van Buren County High School where he is an assistant principal. He worked diligently to recruit professionals from surrounding areas in Eastern Tennessee such as Crossville, McMinnville, and Spencer. Copeland’s story shows how this program meets the needs of students by making it possible for them to take courses close to where they live and work. Faculty and administrators are open to and encourage innovation in order to create a learning environment that benefits students acquiring their Ed.S. and the school systems served. The Womack Educational Leadership Department offers both the Master of Education (M.Ed.) and Specialist in Education (Ed.S.) with a major in Administration and Supervision. Administration and Supervision programs leading to an M.Ed. include specializations in Public School K-12 and Higher Education; those leading to an Ed.S. include specializations in Instructional Leader Licensure and Higher Education. A student has an interest in forming a cohort. Student checks with others in his or her area of work. Student sends an inquiry to Dr. Marvin Peyton with names of interested students. Dr. Peyton can be reached by phone (615-585-8310) or email (Marvin.Peyton@mtsu.edu). When enough students are interested (typically between 8 and 12), Dr. Peyton will call an “interest” meeting to discuss all aspects of the upcoming cohort. Once students have decided to pursue forming the cohort, Dr. Peyton will hold an enrollment meeting for cohort candidates. Then students are set to begin work on their graduate degrees! Students will complete requirements including a foundations core, a specialized core, and elective hours in order to develop a specialized professional knowledge base and skills in the student’s chosen area. Also available are both on and off-campus cohorts. Administration and Supervision, Instructional Leader Licensure Program Specialization, Ed.S. The Ed.S. in Administration and Supervision offers specializations in higher education and instructional leader licensure program (K-12 administrator license). Identification and investigation of the problems of supervision and research; experimentation in the use of supervisory techniques. Readings in current research relative to basic and emerging ideas of curriculum development and instructional design. The program is offered only in the off-campus cohort format. For further information, contact Dr. Marvin Peyton in the Womack Educational Leadership Department. Students taking courses for licensure renewal, add-on endorsements, or "plus 30" upgrade on teacher licensure should register as non-degree students. Students enrolling in 6000-level courses must hold a bachelor's degree, and students enrolling in 7000-level courses must hold a master's degree. Non-degree-seeking students cannot register for 7000-level courses without departmental permission.